We’re off to the races. Becca got the first date. Krystal got a rose and went straight to meet the parents. 15 ladies went on the group date and played adult-sized bumper cars. Krystal revealed she had a tough life growing up and her brother was homeless. Annaliese revealed she doesn’t like bumper cars. I’d like to upfront apologize to all those out there that have also had bumper car trauma and or have been hurt having to be subjected to the phrase “pillow lips.” Twitter was very unkind to you. Who got kicked off: Jenny, Lauren G., and Valerie were sent home never to be remembered again. Although, Jenny did make a dramatic exit, breezing by Arie and telling him she was there to make friends and apparently this was the first time she was broken up with. Well, she is handling it well. First one-on-one date: Becca Whisked away on a motorcycle, Becca was first one to go on a date, zipped up in a leather jacket and riding down the highways of Los Angeles. He showered her with Rachel Zoe gowns and Louis Vuitton heels and Neil Lane jewelry. I feel like this date was designed (See what I did there. The Bachelor interns would be proud.) to make the other girls jealous and make Becca the most hated woman in the house. Because Becca got to keep ALL of the swag, take it back home and then meet Arie later in the night for the rest of their date. Still a great date. Awkward because Becca just modeled the clothes, but I think they got to hang out by the pool after the promenade. Best Quote: “Have you ever done this before?” She asked, referring to Arie putting the earrings on her ears. Umm…not exactly what I was picturing, but suuure. He really likes to kiss Becca. Another Great Quote: Arie to Becca: “I feel like you reminded me most of myself when I was on The Bachelorette so if you have any questions just ask.” That feels more like a big brotherly role. But he likes to kiss her. I’m unsure. I’m so confused! One-on-one: Krystal went on a one-on-one date back in time with Arie to Scottsdale, AZ. They drove by the high school. He showed her where his first kiss was, his first job at pizza hut and then proceeded to go through old family photos (videos included). The real kicker is they went to meet the fam bam. Krystal met mom, dad, bro, and bro’s recent wife. Krystal handled it well. Group Date: Aka the best date ever. Demolition Derby was the name of the game, where you basically crash into each other until your car stopped running with only one woman standing. A-mazing. AND you got to spray paint a car. 15 ladies were on this date. 15 ladies drove around in derby cars to ram into each other. Everyone wanted to know who painted the 9 car and transformed it into the epic 69 that it was. Creativity at its finest. That my friends was our good friend, Brittany T. Arie, the sweatheart that he is, made sure to check on Brittany at the rose ceremony because she was out for whiplash. Bibiana asked where the track was in Miami because it was gonna be her new therapy. Get it, girl. Meanwhile, Annaliese flashed back to a traumatic bumper car incident where she remembered getting trapped in the middle and getting hit. “And I just remember being so alone and so scared.” I’m sorry, but I’m pretty sure that’s HOW bumper cars work. Like it’s inherent in the game. I don’t understand. 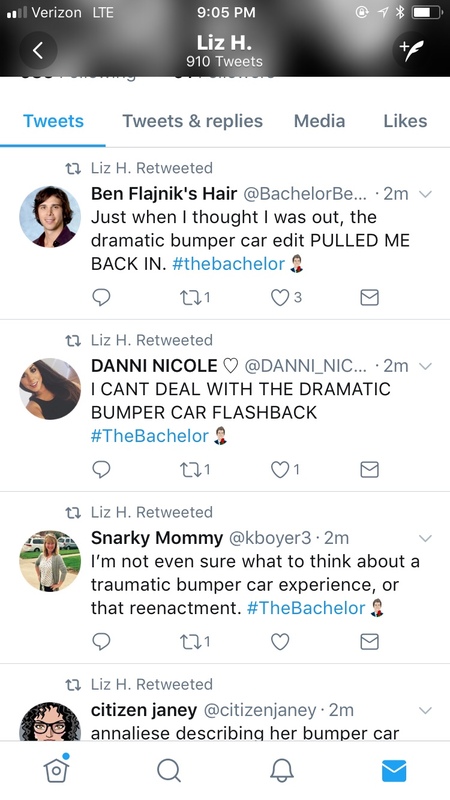 I’d like to formally apologize on behalf of all of the friends on the Twitter universe, if you have ever been personally victimized by bumper car trauma. Best Quote: “So could this be the first time Arie actually wins something on a race track.” Chris Harrison with the shade. Bashelor Instant Replay camera for the win. Seinne was the winner. Seinne went to Yale and lived in Scottsdale for a time. Keep an eye on this one. Rose on the Group Date: Seinne got the rose on the group date. I love when they interview Bekah C. and they always ask how she’s feeling and she’s always like “I’m so good,” and then they bring out a one-up by another girl. I would like this to continue. It’s very entertaining. One of the girls said, “We all have such personalities and we’re all trying to figure out what he’s looking for.” Lemme help a sister out. He’s looking for blondes and Beccas. Arie explained he had a friend that collected doll parts, so he gets it. Kendall’s response: “See that’s creepy. Doll parts are creepy,” says the girl who collects taxidermy. Jenny went home in a huff and was really just upset the taxidermy collector beat her out. And she was there to make friends and become Instagram famous. And she had never been broken up with. And girl needs to get over it. She’s out week 2, bummer, you’ll survive. Best Tweets of the Night: Shout out to these Twitter folk who narrated each moment lovingly. Bachelor Winter Games premieres February 13th and my heart is warmed by the full winter ahead of me! A new episode of The Bachelor airs tonight 8|7c on ABC.